Chromeo at the Commodore Ballroom, Vancouver, April 15 2014. Kirk Chantraine photo. When you go to a Chromeo show, there’s pretty much only one thing you expect to do, and that is to party. The duo of Dave-1 and P-Thugg, whose choice of monikers should say everything you need to know about how serious they are, have been making fun, cheeky party funk for over a decade. With the release of their fourth album White Women this year, their star has risen higher than ever. With marquee shows at Coachella, Bonnaroo and other mega-festivals, its safe to say at this point that they are bona fide stars. 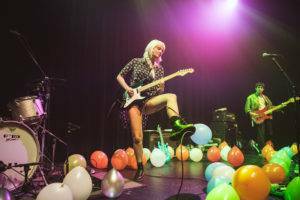 Their sold-out show at the Vogue on Saturday – their second Vancouver show this year – attracted a wide cross-section of Vancouver. I saw Iron Maiden T-shirts next to dudes in suits, girls with glitter and glowsticks next to hipster bros in ironic trucker hats. During every song, at least some group was singing along to every word, even when the duo played some of their really early material. A large part of Chromeo’s enduring appeal is their perfect mix of sleaze and charm, and it was on full display as they ran through hits from all their albums. The funk was contagious and even the most seasoned cynics would have had a hard time keeping their hips stationary. Dave-1 and P-Thugg were clearly enjoying the enthusiastic crowd and worked it for all it was worth. For “Night by Night”, they asked for as many women as possible to get on someone’s shoulders, which was quite an impressive sight. Even more impressive was the stamina of the guys who held their ladies up for the entirety of the song (and some beyond that). There were auto-tuned requests to scream from P-Thugg, followed by more requests to scream louder, and many chances to throw your hands in the air. For the closer “Don’t Turn the Lights On” we were requested to two-step and the whole venue let loose. Their light show was top-notch, with beams of white light shooting in every direction and strobes going non-stop during almost every song. There probably should have been an epilepsy warning beforehand. A couple of times during the show Dave-1 strutted out centre-stage with his shiny all-chrome guitar. 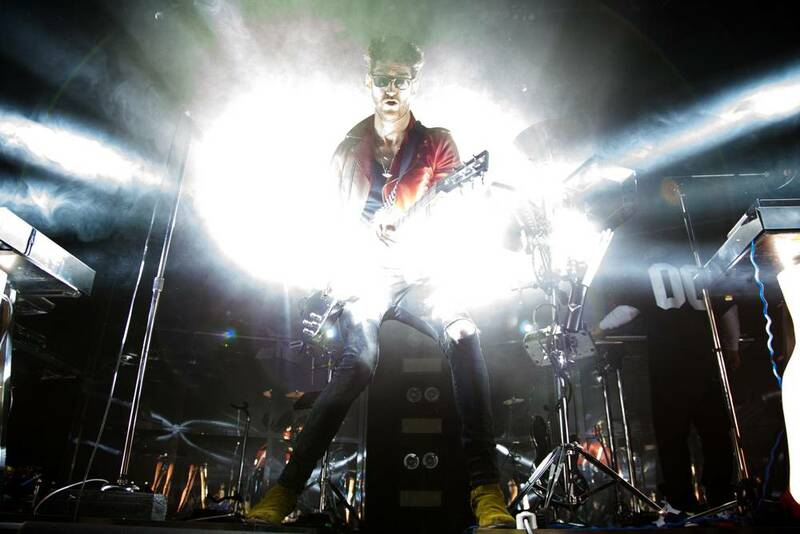 Bright light beams shone onto the guitar and he shot the reflections back onto the audience. It felt like being anointed by a party god shooting blinding lasers from his crotch. Needless to say the audience loved it. Opening for Chromeo was Wave Racer, aka 19 year old Thomas Purcell. Hailing from Sydney, Australia, he makes happy, tuneful beats with a seriously heavy low end. If Basement Jaxx decided to make trap music, it would probably sound something like Wave Racer. His set was good, but there is only so long I can watch someone on stage twiddling knobs, especially with Chromeo’s gear teasingly laid out. 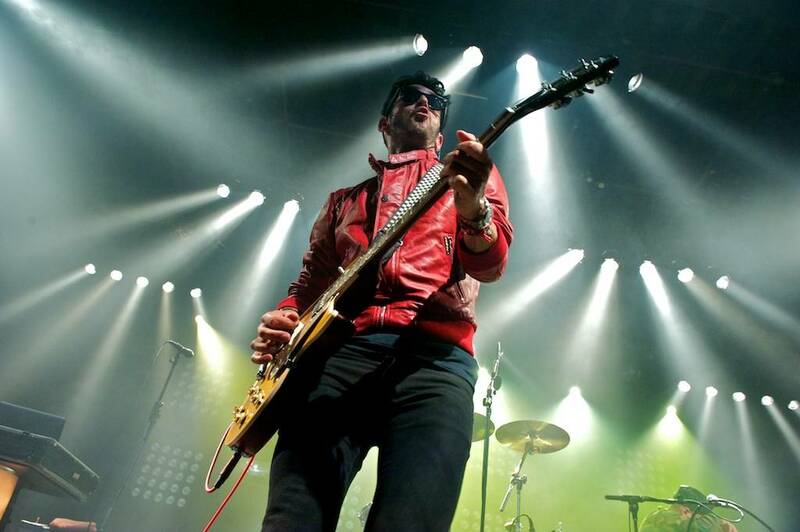 This entry was posted in concert reviews, Features and tagged Chromeo, Vancouver concerts, Vogue Theatre. Bookmark the permalink.